Color can change the way you perceive architecture, and it’s the least expensive remodel you can do! Drive around any neighborhood and you’ll see that color changes how you perceive each home. Check to see if your neighborhood has any restrictions regarding exterior paint color use. Often titled Covenants and Restrictions these rules will limit the choices you have. If your neighborhood is a designated historical area check with the local Historical Society or Building Dept. to learn if paint colors are restricted to historical colors typical to the era your house was built. 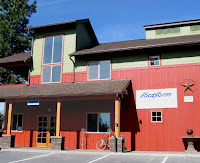 The example of the commercial building above demonstrates the third paint color as the natural warm toned wood stain. Notice how the wood trim around the upper windows (in the green area) is red, but in the red area, there is no additional color. I simplified the trim treatment in this part of the building to reinforce the visual integrity of the larger shapes. My point is that you don’t have to do the same thing in every part of your paint job — mix it up if the result is stronger. Buy the best house paint you can afford and make sure it has a UV blocker in it. Whether you are painting your house yourself or having it done, make sure that the paint prep work is well done. A good foundation of prep work will make your final paint colors last years longer. If you have a strong prevailing wind/sun direction, put a extra coat of house paint on those sides of the house. The entire exterior paint job will last years longer. Contact me to schedule a color consult for your project.